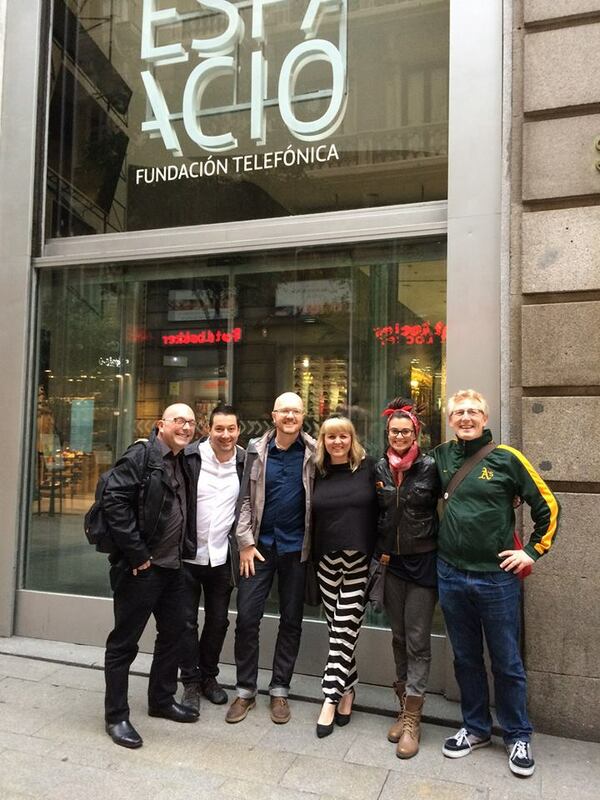 I had a great time in Madrid at the Transmedia Living Lab. I really enjoyed catching up with David Varela, Simon Staffans and Robert Pratten. I also enjoyed having a mini-holiday in the afternoon and evenings in Madrid: wandering the streets looking for the best Gin Mojito, shopping, sitting in the park, seafood paella dinners at 9pm. There were a lot of students, researchers, and practitioners at the event, and there was plenty of opportunity for lengthy Q&As — so that made it a more satisfying experience. While I was in the air flying back from Madrid, a sneak peek of my forthcoming game Magister Ludi was shown at a private Experimenta event. Magister Ludi was also selected as part of the Freeplay Independent Games Festival event Parallels. I recorded a video to describe the work and Goldie (the artist) helped out with doing a bit of a walkthrough. Very excited. Indeed, production of Magister Ludi has continued since I have returned. Along with the Art, Sound, and Programming, this week has involved finishing the installation part of the work. 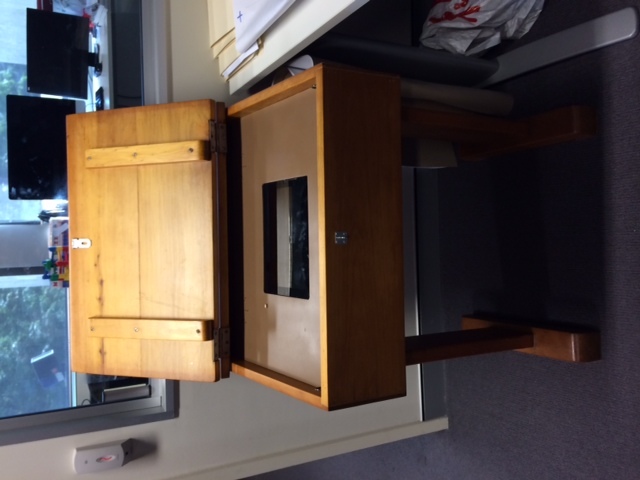 I bought an original 1950s school desk and had Greg Quincey do the carpentry to install an iPad. The carpentry ensures the iPad is secured along with the cords, but at the same time makes it easy for the exhibition staff to open the panel and make any adjustments. I have tested downloading the build through TestFlight with a special account I created for the iPad, so we can update the game easily while it is on the road if necessary. We have to make sure the installation can tour easily as the Experimenta Recharge event tours Australia for a year. Along with the equipment is of course the game elements. Cameron has set up special Google spreadsheets so I can update the dialogue any time there, and then he just downloads and imports it to Unity (as opposed to him copy and pasting from a spreadsheet). This works much better and frees me up to keep making tweaks. 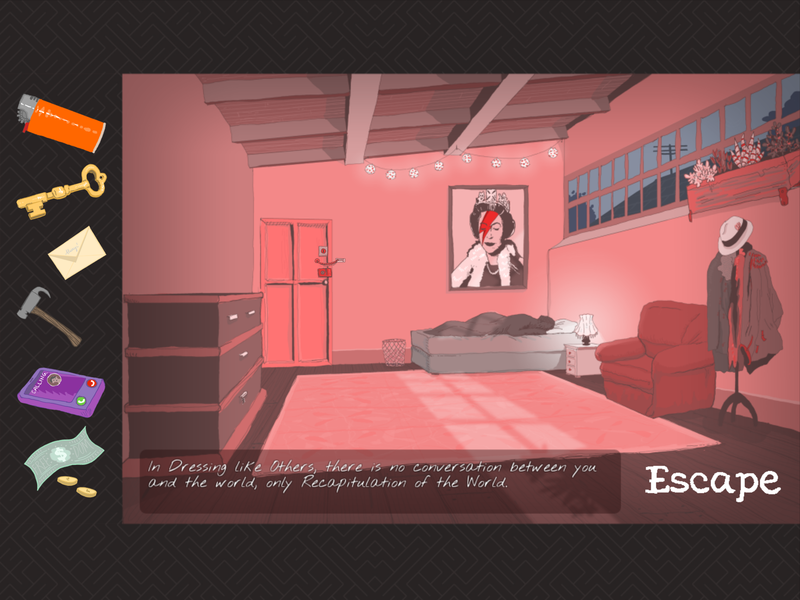 The Art for most of the rooms is done, and so is the Sound. Goldie and Trevor have done a great job (and Cameron), and so I’m really looking forward to seeing the entire build together (and then tweaking). The game will be available online as well, so anyone not in Australia or not able to go to the exhibition can experience it as well. More news soon! Magister Ludi is alive and Forward Slash Story lives again!